Both of us like gardening. We haven’t been able to do too much this summer with it being our first year and being busy buying furniture and art, planning improvements to the Inn and hanging out with fun guests. Gardeners out there: have you ever gone through gardening withdrawal? If yes, then you know how we feel. The good news is that we’ve ordered lots and lots of Spring bulbs for next year. In the meantime, we have a very pretty garden that the former owners doted on, with herbs and some nice bulbs and perenniels to get us started. And we have some flowers growing in the wild along the creek and our little lake. One of our recent guests, Judith, told us their names. 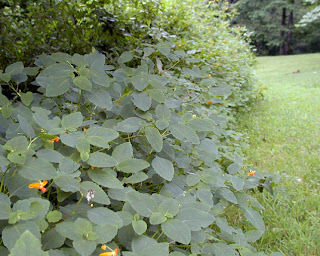 Jewelweed (Impatiens capensis) grows in moist soil, often near poison ivy. 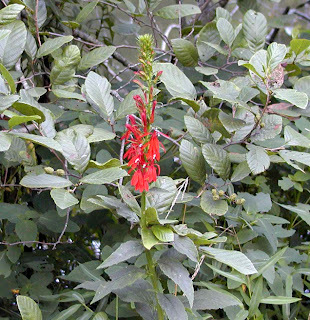 This is actually a good thing, because when you’ve been exposed to poison ivy, you can crush the stems and leaves of jewelweed, rub it on the affected spot, and presto — poison ivy remedy. We hear it also works well on mosquito bites, but we just haven’t had any mosquitos this year to try it out…not that we’d want to be mosquito-bite guinea pigs. 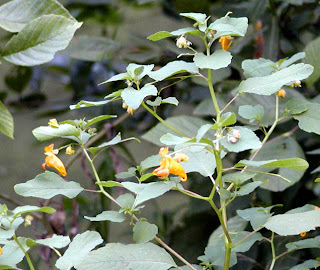 The orange and yellow jewelweed bloom is quite attractive. It’s a tall, vividly colored red perenniel. It’s said that the common name refers to the brilliant red robes worn by Roman Catholic cardinals. Hummingbirds love it, and anything that brings out the hummingbirds is a good thing to have in our opinion. In this time of our gardening withdrawal, it’s nice to know that Mother Nature is doing a little gardening for our guests and us to enjoy.